Today I’m pleased to have fellow author Kathryn Jones on the blog to discuss her sci-fi novel, Lightshade. Stick around for her author interview, as well! 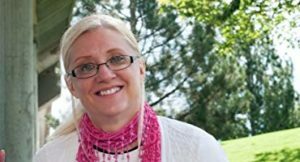 Kathryn writes in many diverse genres, and it’s great to spotlight her work. The year is 2037. The Earth is about to be destroyed along with the human race. Fortunately, Aaden’s father is an astronaut. Unfortunately, Aaden’s family is not on the planet’s escape list. With only two weeks before Mercury blasts through the Earth, the Prescott family must travel by foot to the Ophir mountains in Utah where a space plane is waiting. They must hide themselves within the plane’s walls and escape Earth before it’s too late. 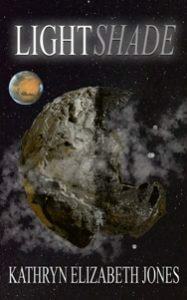 With the help of Neva, an alien living secretly on Earth, they will get additional help – enough to keep them going. But will Aaden have the courage to use the powers within him he is only beginning to understand? Will he have the faith to listen? And if so, will time be in their favor, or will the Earth and all its inhabitants, ultimately turn… LightShade? Kathryn has been a reader since she was a young child. Although she took classes in writing as a teen, it wasn’t something she really thought would become her career until she was married. And even then, it took a few more years for something worthy enough to publish to manifest itself. Kathryn’s first book was published in 2002. Since then, many other books have found their way out of her head depending on the sort of day she is having. Kathryn is a journalist, a teacher, a mentor, an editor, a publisher, and a marketer. When did you first realize you wanted to become a Writer/author? When I was little, I always loved reading, but it wasn’t until I was in high school that I began thinking about writing. I didn’t really begin writing seriously, however, until after I was married. I was pregnant with my first child at the time, and, long story short, was sick morning, afternoon and evening. The nausea subsided as I wrote down my feelings on paper. I get ideas from practically everywhere, including my husband who slides in ideas all of the time. The Parables of Virginia Bean is his idea, prompted from an email from his nephew about David and Goliath and the five stones David gathered to slay him. What kind of things do you enjoy when not writing? I still enjoy reading, and am usually working on reading two books at once. I also enjoy home decorating and remodeling and catch many of the episodes on HGTV. I have written and published 16 books. My favorite for a long time was Conquering Your Goliaths: A Parable of the Five Stones, the first book in the Parables of Virginia Bean series, but I have recently published my first science fantasy book, LightShade, (a genre I thought I’d never write) and a picture book, Mooseberry Mooseberry Gooseberry Pie (which I thought I’d never find an illustrator for). These two are my newest loves. Do you have any suggestions to help others who have a passion for writing? Yes! Write, write, write; read, read, read! Some people won’t get it because they don’t get you. They may not be supportive, they may even be critical, but your TRUE fan base will be with you every step of the way – even BEFORE you’re publishable. Strong, believable characters, and a story the reader just can’t put down. C.S. Lewis has been my favorite for a long time. He is inspiring and brave in everything he writes. I am currently working on Slipped Up, the third book in the Brianne James Mystery series for YA readers. I am also updating my book, Marketing Your Book on a Budget 2019. The second book in the Aaden Prescott Space Adventure series, LightDescending, is ready for its second draft. What genres are your books? 10. What drew you to the genres you write? Besides my mood swings? Probably my love for reading these genres. 11.Which Actor/Actress would you like to see portraying the lead character from your most recent book? A moose? I’m not really sure, but it would have to be a cartoon I think, with someone popular doing the voice. Who sounds like a moose in Hollywood? Of course, if you really think about it, it’s the child who is speaking in the book, not the moose at all, so we’d need to find just the right child’s voice. 12. Do you write full-time or part-time? I write full-time when I can, but most of my writing is done part-time. I own and operate Idea Creations Press, which takes a good portion of my time. I also have a part-time job outside the home, which makes for some pretty interesting days. 13. What is the hardest thing about writing? The marketing that comes after it, hands down. 14. Any tips on how to get through the dreaded Writer’s block? I don’t have it. Really. When I get stuck on a project, I just advance to another. I usually have at least two projects going at once. 15. Do you read much, and if so, who are your favorite Authors or genres? I read a lot, but I read varied authors usually. I have my favorite – as stated before – but what I’m really looking for is an engaging book with a powerful take-away value. I want to remember it for a long time. 17. How can Readers discover more about you and your work?